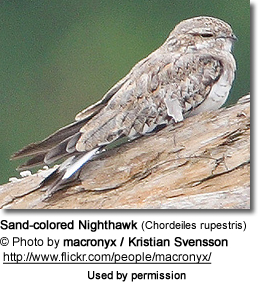 The Sand-colored Nighthawk (Chordeiles rupestris) - also known as White-throated Nightjar - is a South American nightjar. In the past, night-flying birds - such as the nightjars - were suspected of witchery. 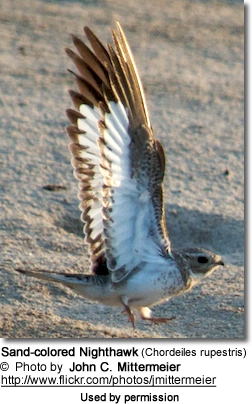 Unlike other nightjars which are less often seen due to their mostly nocturnal (active-at-night) habits, the Sand-colored Nighthawk is frequently active during the day and is often seen in large flocks. However, their sand-colored, mottled plumages keep them well camouflaged during the day. They are found near marshes and on rocky islands, sand bars and sandy beaches on Amazonian rivers, subtropical and tropical moist wetlands, marshes, shrubland and heavily degraded former forests. Range: Northeastern Ecuador, northeastern Peru, Southeastern Colombia and southern Venezuela east through north and central Brazil and south to central Bolivia. They are medium-sized nocturnal birds with long pointed wings and very short bills. They have short legs and small feet, of little use for walking. Their soft plumage is cryptically colored to resemble bark or leaves. They can be identified by their white underwings and the dark / blackish outer wing feathers (primaries) with a trailing edge. Their cryptic appearance blends perfectly into their habitat. Their presence is most often made known by their loud calls made at dusk or when out foraging in flocks. 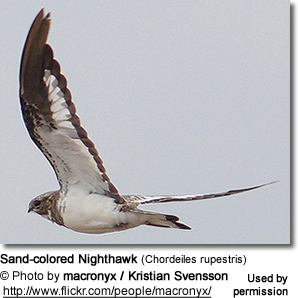 Sand-colored Nighthawks don't actually construct a nest, as most other bird species do. They simply place the eggs on the ground on open soil covered with dead leaves. During the day, the incubation of the eggs is undertaken by the female, while both parents share the incubation at night. The incubation period is about 19 to 21 days at which time the hatchlings emerge covered in down. They are capable of short-distance movements within 24 hours of hatching. The male stands guard and defends the nest and thechicks. The adults communicate with their offspring via soft clucking sounds to which the chicks respond. Both parents feed their young regurgitated insects, and they continue to brood them until fledging. The chicks take their first flight when they are about 20 to 21 days old.